First, let me answer this question – what is a domain name? A domain name is the unique URL or address for your website. The domain name for Amazon is amazon.com, Google is google.com. Our domain is sumydesigns.com. This is how a person will find your website and if you want to have a website that’s online, you need one too. What about domains like mybusiness.wordpress.com or mybusiness.diybuilder.com – is that the same? Kind of. You can put a website online on any domain, including a domain that isn’t custom to you, such as what you get when you use a commercial DIY website tool. And if you are just creating a fun blog or journal for personal use, this is absolutely fine. If you have a business, though, you need to have a domain name for your business. Why does your business need a unique domain name? There are so many reasons. Your business needs a domain name for credibility. It looks a lot better to your customers if they can find you at mybusiness.com rather than mybusiness.wordpress.com. It’s great advertising and looks better on your marketing material. And a domain usually costs less than $20 a year, it’s a worthwhile investment for your business. If you are thinking about getting a website, then one of the things you need to think about is what your domain should be, and there are definitely some things to consider. First, what is the name of your business? It is easy to spell? Is it easy to remember? If you run a local lawn service business, but you have a long name that may be hard for people to remember the spelling, then you may want to go something more generic than your name. Instead of schwichzterfamilylawncare.com, which may be difficult for people to spell, another option might be familylawncareportland.com. When choosing a domain name, think about what someone might Google search in an effort to find you. Are they going to Google your business name? Then that’s a good choice. If you do have a business with a hard to spell name, it’s not a bad idea to buy domain names of common misspellings and forward those to your website. There’s no benefit to having lots of domains for your business in terms of SEO, but if someone frequently misspells your name, there’s no reason why you can’t get them to the right place. If you think I’m joking, go head and type amaazon.com into your address bar and see what website comes up. The best domain name is usually your business name, but it may not always be possible. The name of your business is generally the best choice for your domain. But it may not always be the right choice or even possible. If your business name is super long, you may want to consider shortening your domain name for simplicity. Instead of joansjuicyfruitcandycompany.com you could use joansjuicyfruit.com instead. Or better yet, buy both. One can be used in marketing materials, but the other can be your main domain. Should you use your location in the domain name? This was a common practice once upon a time, but the thing to note here is that Google knows where you are, they know where your business is (especially if you have a Google Business Listing, which you should.) So you don’t need to put the location in it in most cases. However, if there’s a business with the same name in another part of the country or world, then this may be the best option if changing your business name isn’t possible. What about domains for authors? Since we do a lot of websites for writers, this is a common question. If you are an author, your domain name should be your name or pen name. Whatever the name you put on your book, should be the name of you website. You may ask, shouldn’t my website be the name of my book? The answer to this will be yes only if you are writing just one book. Instead, your website should be at yourname.com, and then each book should have its own page on that site. And yes, you can and probably should buy the domain name for your book and forward it to that specific page on your website. You should typically not have a stand-alone website for each book. It’s expensive and it’s harder to manage and maintain. Even big time authors like John Grisham and Stephen King don’t have a separate site for each book. What about buying lots of similar domain names to yours? There is no SEO benefit to owning lots of domains. If there’s no website on a domain, then Google essentially does not know that domain exists. So don’t go buying up domain names just to have a bunch. Prevent your competitors from buying them. True story, there is another web design company out there with a very similar name to ours and I’m kicking myself that I didn’t buy that domain name when I bought the rest of them. Prevent someone from spoofing your website/business. It’s not a bad idea to buy the .net and .org versions of your domain name, in the event that someone wanted to spoof or steal your business, they could set up a similar website at one of those domains and try to get your business. Catch common misspellings. If your business name is commonly misspelling, get those misspellings too. If your business has a plural name, get the singular too, just to be safe. Add a shortened url for marketing. If your domain is long, buying a shorter version to put on your marketing materials isn’t a bad idea. 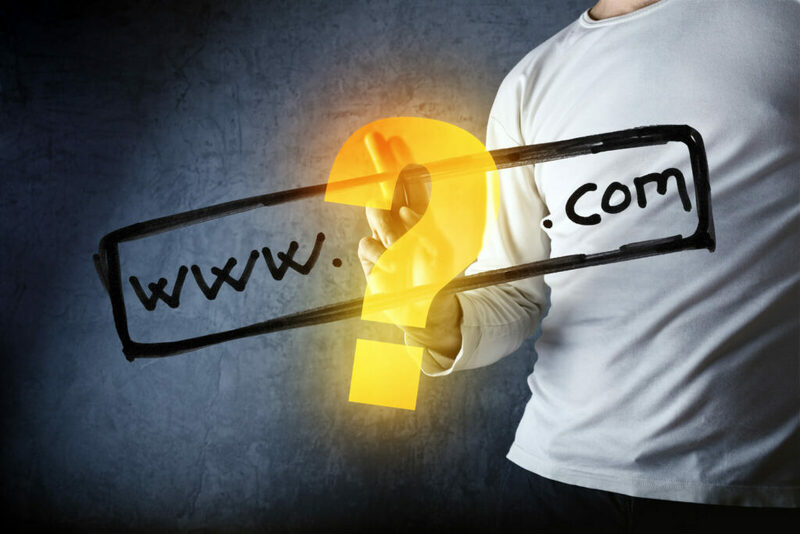 Need help figuring out the best domain name for your website? We’re happy to help! Contact us for a quote today.